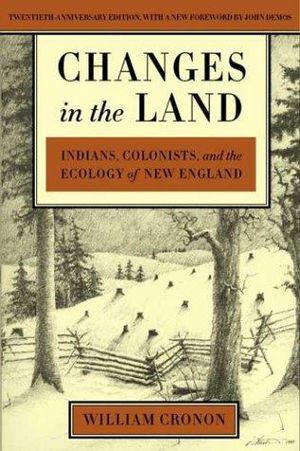 Difference between revisions of "Changes in the Land: Indians, Colonists, and the Ecology of New England - Book Review"
Comparing pre-colonial Indian ways with the alterations brought by European settlement, one of the clearer observations that Cronon draws upon is the failure of Europeans to grasp the meanings behind Native American ecological practices. This lack of understanding emerge in several instances. For example, colonists failed to comprehend why Native Americans lived, in European eyes, in state of poverty, “the way Indians had chosen to inhabit that world posed a paradox almost form the start for Europeans accustomed to other ways of interacting with the environment. Many European visitors were stuck by what seemed to them the poverty of Indians who lived in the midst of a landscape endowed so astonishingly with abundance.” (33) Other examples of misunderstanding proliferated. Deforestation provided the “most sweeping transformations” as flooding became more common and certain species of trees (white pines, white cedars, and white oaks) due to colonial practices, diminished. Use of trees for fuel proved the largest reason for deforestation. The loss of trees meant more flooding and even changes in the landscape’s response to weather, “In wintertime, the effects of clearing produced even more complex set of changes in these relationships. Although cleared land tended to be colder in winter than forested land – because drier and more exposed to the effects of the wind chill – it received enough radiant heat from the sun to melt the snow more quickly … It was not, as some thought, that the weather itself was changed by clearing, but rather the way landscapes responded to the weather.” (123) New England colonists drove much of this deforestation since in European minds clearing marked another means toward civilization. Europeans saw deforestation as “the progress of cultivation”, they hoped to recreate the environment in the image of their home continent, “for the New England landscape, and for the Indians, what followed was undoubtedly a new ecological order; for the colonists, on the other hand, it was an old and familiar way of life.” (126) Pastoralism also undermined Native American subsistence patterns. In addition, the combination of deforestation, flooding, soil compaction, and intensive plowing led to increased soil erosion.